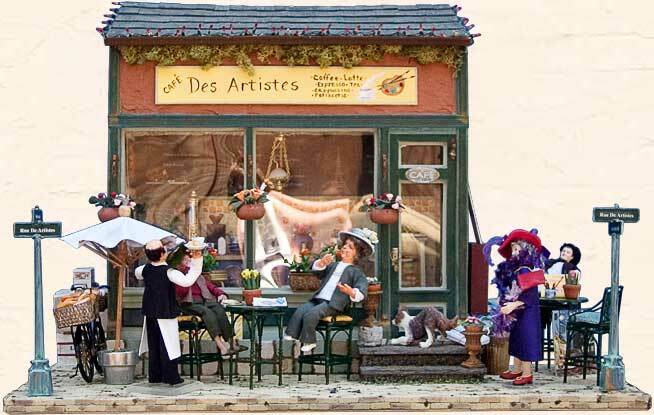 25" x 13" x 17"
The chic Café des Artistes was created as a spoof of a local Sausalito café on Caledonia Street, whose walls are adorned with the works of local artists. One local artist sits on the patio of the café painting and selling his pieces, some of which aren't even dry when sold. The ladies from the hill have ambled down for a bit of festive conversation and a latté or two. Of particular note: the seat cushions are made of the material Pierre Deux, and the patio umbrella has been hand-made by the artist.